Stars of stage and screen Robert Bathurst and Amanda Donohoe compete to buy antiques to fetch the biggest profit at auction. They scour Norfolk and Lincolnshire, ending in Kent. It's curtain up on a road trip battle as two stars of stage and screen, Robert Bathurst and Amanda Donohoe each have £400 to spend in bid to buy antiques that will make profits at auction. 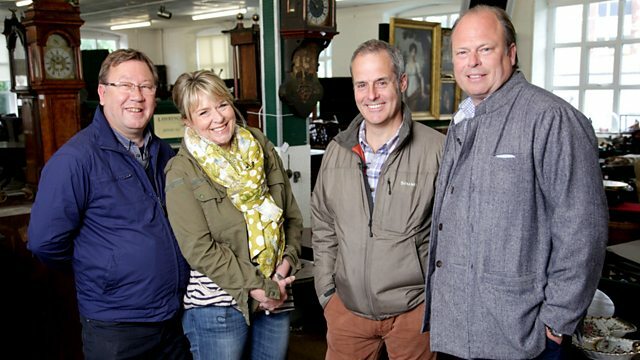 They'll be joined by experts Philip Serrrell and David Harper as they take to their classic cars on a jaunt through Norfolk and Lincolnshire, ending at auction in Kent, and on the way Amanda discovers that the secret history of Valentine's day has a dark twist.